A handy worksheet to help guide students through their thoughts about any situation in which they have been involved in a friendship dispute. Using the questions, students fill in each part of the sheet to help clarify (for themselves and adults!) what actually happened, how they feel, how they helped and hindered the situation and what they think should happen next. 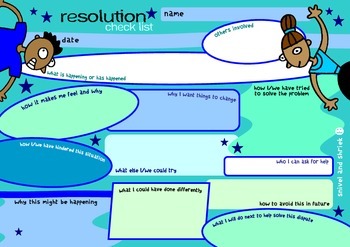 A great resource to support social skills, anger management and wellbeing.